Established in 1999, the Houston Baptist University Retirees Association provides an opportunity for former employees to continue cherished relationships with one another and the University. During the academic year, the Association holds three lunchtime events for attendees to fellowship during a meal and hear from a University representative or student group. 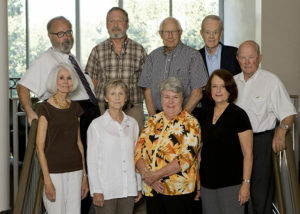 The Retirees Association is a dues paying organization, consisting of former administrators, faculty, staff, and their spouses. Members must have completed ten years or more of service* to HBU. *Members not meeting these requirements and desiring membership should make application to the Administrate Board of the Retirees Association. Click on meeting date to RSVP and / or pay Association dues via a secure site. Luncheon and meeting reservations can also be made by mailing a check to the Treasurer or calling Linda Clark, (281) 649-3434. Keep up with us on social media by joining our Facebook community. *Dues can be paid through the online event RSVP form, a check mailed to the Treasurer prior to the meeting, or dues can be paid at the meeting. Click below to view the minutes from past meetings. While the HBU Retirees Association serves primarily as a social organization, from time to time a project or cause is brought to the attention of the Executive Committee who votes to share the opportunity with the Association. Given the University provides a partial operation budget each year, the Association will use accumulated dues payments to cover the support of these projects. President Rhonda Furr to consider forming an organization for retired faculty and staff. The proposal was accepted and a faculty committee appointed to consider this possibility. successful period of organization and growth ensued. appropriate by the Administrative Board. Edward D. (Doug) Hodo, Sr.